Educational policy and social sciences researchers have been studying dishonest behaviors among students for a long time. In this bibliometric study we examine the extant literature on academic dishonesty until 2017. We also analyze the specific case of the literature on plagiarism (as a specific type of academic dishonesty) since it is arguably one of the most common academic dishonest behavior. We aim at identifying the intellectual structure of the field of academic dishonesty and plagiarism. 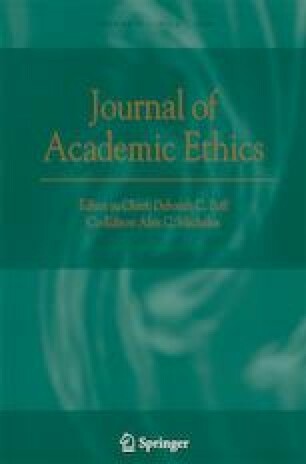 Results show that Donald L. McCabe (academic dishonesty) and Richard L. Marsh (plagiarism) appear as the most productive authors. Furthermore, Whitley (Research in Higher Education, 39(3), 235–274, 1998) “Factors associated with cheating among college students: A review”, and Pennycook (TESOL Quarterly, 30(2), 201–230, 1996), entitled “Borrowing others’ words: Text, ownership, memory, and plagiarism” are the most cited publications on academic dishonesty and on plagiarism, respectively. Additionally, a strong connection between the McCabe and Treviño articles emerged from the co-citation analysis on academic dishonesty, and also a strong relationship between Pennycook (TESOL Quarterly, 30(2), 201–230, 1996) and Pecorari (Journal of Second Language Writing, 12(4), 317–345, 2003), suggesting that these articles are strongly connected. Results suggest that these are the most influential authors and articles of the field. The online version of this article ( https://doi.org/10.1007/s10805-019-09328-2) contains supplementary material, which is available to authorized users.